In collaboration with the TN Center of Excellence, the Center for Agriculture and Food Security and Preparedness (CAFSP) at the University of Tennessee has produced a series of CDC-funded, free, online courses focused on foodborne outbreak investigations and team development. The online courses may be taken either as introductory training or as refresher training for more experienced staff. The standalone online courses take 3-5 hours each and can be completed independently by team members. Jurisdictions can download complimentary tabletop team activities to continue the development of the acquired knowledge of the public health professionals who have completed the online courses. The CAFSP is certified by the International Association for Continuing Education and Training (IACET), and participants who successfully complete the CAFSP online courses will be awarded Continuing Education Units (CEUs). An overview of knowledge and skills necessary to conclude an investigation. Developed by the National Environmental Health Association and the Centers for Disease Control and Prevention, Epi-Ready is a two-day in-person workshop for environmental and public health professionals with responsibility for the investigation of foodborne illness outbreaks. With a team-based approach to training, Epi-Ready focuses on how to efficiently and effectively respond to an outbreak by understanding the roles and responsibilities of the disciplines involved—using the analogy of the 4-legged stool. 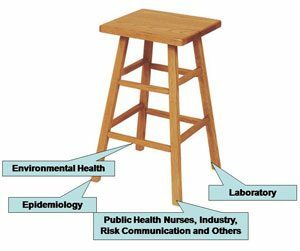 The Epi-Ready 4-legged stool represents collaboration between the three disciplines involved in a foodborne illness investigation, environmental health specialists/sanitarians, epidemiologists and laboratory staff. The fourth leg of the stool comprises all others who directly or indirectly are involved in outbreak investigations, including public health nurses, health educators, industry, risk communication/public information officers, and others. Workshop content is designed to follow the Council to Improve Foodborne Outbreak Response (CIFOR) Guidelines. Topics are covered through a combination of lecture, question and answer sessions, interactive group exercises and final case study. Better understand the roles and responsibilities of all disciplines in an investigation. Build a more efficient working relationship and open lines of communication with partners. Understand that collaboration is KEY! This training is designed to provide teaching strategies for potential instructors to train staff in their agencies or departments. This training emphasizes the importance of the teamwork involved in foodborne disease investigation. We encourage attendees from environmental health professionals, epidemiologists, and laboratory staff from the same or partnering agencies or jurisdictions to attend.